Swelling is one of the cardinal signs of inflammation, along with heat and pain. 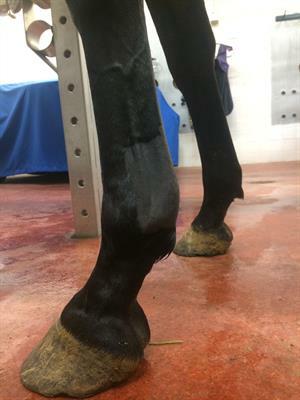 Careful observation of the horse at work followed by thorough palpation of all limbs immediately post exercise and post cooling down is vital to the early detection of swelling. By identifying signs of inflammation early, steps can be taken to reduce it and thereby potentially reduce the severity of the injury. Soft tissue injuries are common in racing Thoroughbreds and they frequently require prolonged periods of rest before reintroduction to racing. The earlier a soft tissue injury is identified, the earlier a diagnosis can be reached and the quicker a horse can get back into training. Images: Obvious "bowing" of the left front tendon region. An indication of ongoing inflammation. In the event of palpating swelling, heat or pain along a horses limb it is paramount that exercise be stopped. At this point cold therapy with pain relief (non-steroidal anti-inflammatories) should be instigated. Ideally ice water immersion for 20 – 30 minutes up to 4 times a day for the initially 48 hours should be carried out. Cold hosing is also effective but can be difficult during the summer months. Cold therapy should continue at a reduced frequency for an additional 2-3 days. If at this time the swelling is still present or there is heat or pain on palpation, then an ultrasound examination of the area will be necessary. Ultrasound examination is ideally carried out 5-7 days post initial injury as frequently soft tissue injuries take some time to mature. The horse should be on strict box rest during this time. 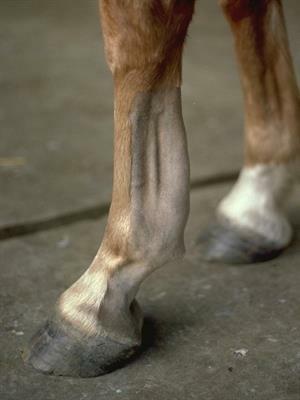 This is because a common cause of swelling of the lower limb is tendon strain, which often do not cause lameness initially. Continuing to exercise a horse with a mild tendon strain risks creating a more severe injury. Once a diagnosis of tendon or ligament strain has been reached a gradually increasing walking program will commence. It is important that exercise be introduced early to promote normal alignment of the tendon fibres during the healing phase. This however must be balanced with any evidence of recurrence of inflammation, in which case exercise must again be reduced. Repeat ultrasound examinations (every 60 – 90 days) are useful to monitor progression of healing/early signs of reinjury. Depending on the nature of the injury additional rehabilitation options can be discussed including regenerative therapies (stem cells, platelet rich plasma, intraleukin-1 receptor antagonist protein), extracorporeal shockwave therapy and laser therapy. The success of any of these treatments pivots on an early, and accurate diagnosis.